Mix all ingredients, form flat, little loafs and fry them in oil. Serve in soup or with Sauerkraut. This dish might sound quite nasty, but at least it is very distinctively Austrian. Make a dough and boil droplets from it in salted water. They are done, when they swim on the surface. Roast the onion in butter golden, add the Spaetzle (the droplets) and the cheese, stir carefully until the cheese is melted. Serve with chives. Punch the meat to make it tender - in Austria hammers are used for that, which is great fun. Then put them in flour, egg and bread crumbs and fry them golden-brown. Boil the potatoes and mix them with butter and parsley in order to cover them with some butter-parsley stuff. 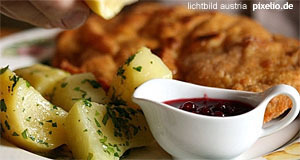 Serve the Schnitzel with the potatoes, a slice of lemon and some cranberry sauce (not too much, about the amount a big seagull shits). Wiener Schnitzel is originated in Byzanz, where people liked to show off with their prosperity by putting gold on their meals. In Venezia this habit was copied, but prohibited by the church. As an alternative, meat was fried golden-brown and became part of "Piccata milanese". This dish was introduced to Austrians, when Venezia became part of the Austrian Empire and turned into the ancestor of the Wiener Schnitzel. Mix all ingredients except soup to a doe and form little dumplings. Boil them in saltwater for about 15 minutes and serve them in the soup or - as an alternative - with Sauerkraut. Mix quark, butter and flour to a doe, season with salt and let it rest for some 30 mins in the fridge. Roast bacon, spring onion and onion in some butter and add the seasoning. Cover a baking casserole with the doe and put the roasted mix on it as for a quiche. Blend the sour cream and eggs and pour this over the pie. Then cover it with the grated cheese and bake for 35 to 40 minutes at 160 degrees Celsius. Serve with salad. Chop the bacon, onion, pickles and carrot into strips and roast them briefly in butter. In the meantime, beat the meat tender and season with salt, pepper and mustard. Put the roasted filling on the steaks and roll them up. Fix with a toothpick or string and roast them briefly in the pan. Fill the pan up with water and add some seasoning if wanted (stock). Boil for another hour at 200 degrees Celsius and thicken the sauce with the flour. Serve with dumplings or mashed potatoes. Cut the beef into pieces and roast briefly. Add the tomato concentrate and vinegar, beer and soup. Add all other ingredients and boil until the beef is done. Thicken a little with flour or starch.